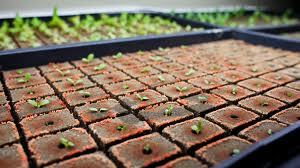 Instead of trying to find more land to grow food on, what if we made more food fit into the land we have? You probably eat almost as much as you weigh in corn every year. In the U.S., we put down an average of about 160 pounds per person per year. Once consumption by livestock and biofuel is considered, the figure soars to 2,074 pounds for every person in America annually. Yet we’re going to need to grow even more. At the moment, the USDA (PDF) reports the world produced about 812 million tons of wheat in 2009-2010. That’s going to increase significantly in the coming decades as the population approaches 9 billion and the amount of food we need to grow approximately doubles. Making plants smaller may be one way to do it. 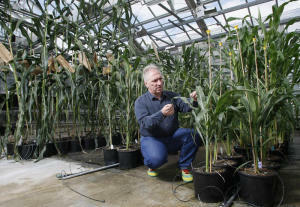 A team from Purdue University and other research institutes have created a dwarf variety of corn using less water and fertilizer to produce the same amount of gain. The researchers pulled off this trick by applying a common fungicide, propiconazole, to genetically engineered corn. The fungicide prevented the plant from synthesizing steroids, creating short, feminized versions of the corn plant that develop kernels in place of pollen. Previous chemicals used to induce this effect cost as much as $25,000 per gram, as opposed to propiconazole, which costs 10 cents per gram, bringing the cost of wide-scale application down to $25 from millions of dollars. “We can change the architecture of a plant the same way that has been done through breeding,”said Purdue’s Burkhard Schulz in a release by Purdue University. Next up will be testing the chemical on other grains to see if it has the same effect. 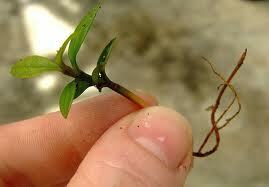 Tiny plants that produce just as much grain won’t feed the world, but they are one more step in that direction.